The following paper was presented for a graduate class on Renewable Energy Systems at the Rochester Institute of Technology on November 17, 2015. I hold all rights to this text. 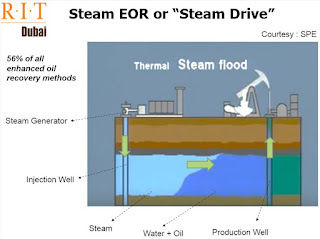 Solar thermal enhanced oil recovery (STEOR) methods are a group of developing technologies aimed at using the power of the sun to help in steam flooding operations for heavy oil fields. The enclosed trough architecture introduced by Glasspoint Solar encapsulates the vision of STEOR by enclosing a concentrated solar plant (CSP) within a glasshouse structure. This article reviews the 7 MW Amal West Plant, the first glass enclosed STEOR plant in the Middle East. It was built and commissioned for Petroleum Development Oman (PDO) by Glasspoint Solar in May 2013. Both companies were jointly recognized for the best oil & gas innovation at ADIPEC 2015. Similar projects are being discussed for Kuwait. While the Amal West plant appears to have run successfully during its first year, long term studies of the enclosed plant’s performance and reliability in conditions specific to the middle east are few in formal literature. This is understood due to emerging level of STEOR implementation. This article conducts an independent assessment of Amal West based on a few of the plant’s performance reports that are available in the public domain. Relevant questions are raised on specific issues which seeks to keep in line with viewing the technology implementation from a life cycle perspective. It is hoped that this work can help create a platform for additional conversation addressing the implementation of unique renewable energy concepts in Middle Eastern oil fields. The global demand for energy over the next two decades is expected to increase by nearly 50%, reaching around 778 EJ by 2035. In the search for near and long term solutions to increase oil production from existing assets, hydrocarbon exploration is reaching global frontiers. Conventional primary and secondary oil recovery methods capture only about 40% of the original oil in place (OOIP) while the rest is left behind . Primary recovery methods, which rely on either the natural rise of hydrocarbons to the surface of the earth or via pump jacks and other artificial lift devices, have a limited recovery potential of 5-10% of the heavy OOIP. When natural lift methods are no longer sufficient, secondary recovery methods are used which involves pumping external energy into the reservoir to produce the missing lift pressure. These artificial methods include water injection, natural gas reinjection and CO2 injection. 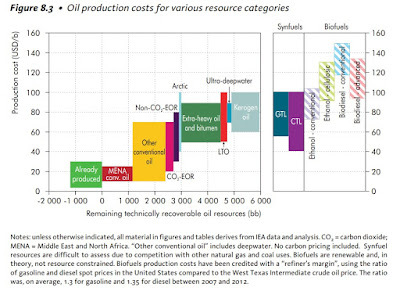 Inclusive of primary recovery methods, total oil recovery will range from 10-20% on average in most heavy oils . 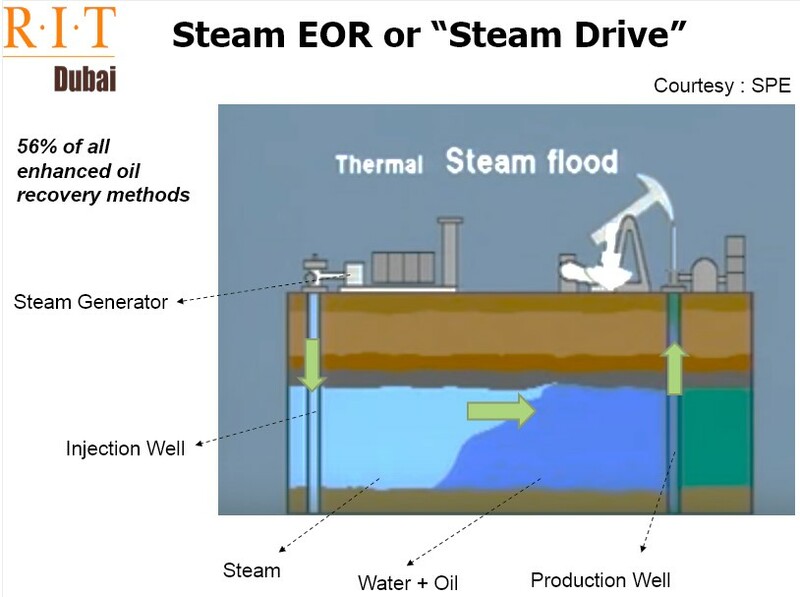 Enhanced oil recovery (EOR) is a broad term given to a group tertiary recovery technologies that help target the remaining 30-50% of the OOIP. These methods are particularly suited for heavy oil. By definition, EOR implies a reduction of oil saturation below the residual oil saturation (Sor) . Recovering heavy oils and tar sands, which have a viscosity of less than 1000 cp upto 100,000 cp, is only possible with the reduction of the oil saturation below Sor. Currently available EOR is based on either increasing the capillary number and/or lowering the mobility ratio, compared to their water-flood values. The capillary number choice of attack aims at reducing oil-water inter-facial tension which is done by using a suitable surfactant or by the application of heat. A 50% reduction in Sor requires that the Capillary Number be increased by 3 orders of magnitude. The reduction of mobility ratio attack is aimed at increasing water viscosity, reducing oil viscosity, reducing water permeability or all of the above. Reservoir geology and fluid properties determine the suitability of a process for a given reservoir. Using the nomenclature adopted by the Oil and Gas Journal, current EOR processes are classified based on the nature of their injection fluid. These are summarized in Table 1 . Thermal EOR methods lower mobility ratio by decreasing oil viscosity. Among these, steam-based methods have been more successful commercially than others. According to a 2000 Oil & Gas Journal survey, steam based projects accounted for nearly 418,000 bpd, or 56% of the total for all tertiary EOR methods . 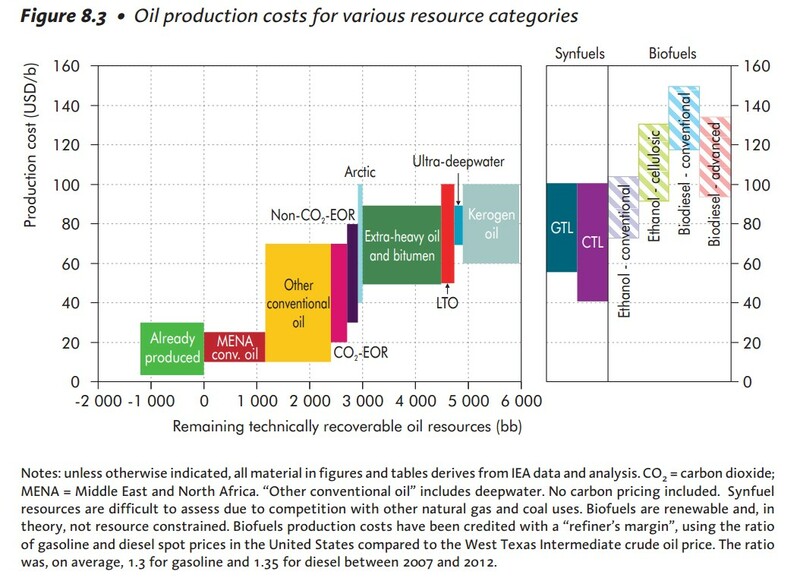 However, in world sensitive to lifecycle cost and environmental concerns, any EOR is poised to face challenges competing with conventional recovery methods if they don’t show the similar (or lesser) costs to produce energy (Figure 1) or display an acceptable level of environmental burden for the same oil output. In steam based thermal EOR, reservoir heating is done by steam injection which translates into the formation of a swept zone of some shape and an oil bank consisting of a migrating zone containing the displaced oil (Figure 2) . Two general concepts have been proposed to describe this process. Field projects usually include features of both frontal advance and bypass processes. Due to economic and environmental concerns, thermal EOR based methods (top left hand column in Table 1) are being increasingly explored, particularly aiming towards the substitution of solar energy instead of gas to produce the steam. Proponents claim the advantages of reduction of gas based heating, its associated CO2 emissions and the isolation of natural gas fired steam generation costs from fluctuations in the price of natural gas . A small privately owned company based out of California called Glasspoint Solar is pushing this technology from what were just drying applications like those used for gympsum wall boards to the EOR steam-flooding arena. The unique aspect of their product is a solar CSP plant that is completely enclosed inside a glasshouse with it's own automated washing system. Glasspoint is not new to the STEOR arena, having delivered the world’s first commercial STEOR plant, the 21Z installation for Berry Petroleum in California in February 2011. However, it wasn't until 2013 when the first pilot plant in the Middle East was built and commissioned for PDO at Amal West, Oman. This pilot plant was constructed between January and December 2012 and transitioned to full production on February 1, 2013. The company claims that interest in STEOR stemmed from the falling gas reserves in Oman, coupled with expectations of volatile gas prices. The motivation for seeking a glass enclosure was to figure out a way to avoid dust infiltration  and decrease plant downtimes due to cleaning related stoppages in the Middle East. Reportedly, wind is the chief cost driver for an enclosed STEOR plant. Being able to withstand gusty winds without an enclosure requires the use of more material and a robust structure. However, with the enclosed STEOR, the company claims that it can bring down costs by cutting down material usage to around 10 kg of steel per sq.m of mirror area relative to a traditional CSP trough's figure of 18 kg per sq. m.
Construction and short term performance reports for PDO’s plant are available for public viewing on Glasspoint’s website. In all, four pieces of literature were consulted in writing this article. The literature inventory is listed in Table 2. Based on these, an independent assessment of the glass enclosed STEOR is pursued in the rest of this paper. The literature review comprised of four documents available on Glasspoint Solar’s website. The first document describes the construction schedule and challenges faced in commissioning the Amal West Plant. The second document reviews the short term performance of the same plant. Both these papers were presented at SolarPACES in 2013. The third document is relatively new, discussing the economic screening aspects of solar based EOR methods. The fourth document is a magazine article that throws light into specific areas of the Amal West plant that was not seen in the two SolarPACES paper. Table 2: Literature inventory reviewed for assessment. Source . Enclosed trough solar EOR (STEOR) is a hybrid variation of the steam flooding concept shown in Figure 1, wherein the major fraction of steam is solar generated while the backup steam is gas generated. Steam is produced exclusively by natural gas at night, although it is not known to what extent the hot water storage at the facility helps. The Amal location of Oman (Lat 18.3233, Long 55.6738) reportedly receives 2,057 kWh/yr of solar DNI (direct normal irradiance). Due to Oman’s low latitude, solar irradiation does not show large seasonal variations. Literature states that if the rate of steam injection is held constant, gas consumption can be reduced by up to 25%. By injecting more steam during the day and less at night, gas consumption can be reduced up to 80% without the need for costly thermal storage. The plant has a design peak output of 14.8 tons of steam per hour and an average output of 50 tons of steam per day. From Source , the schematic shown in Figure 2 and the process flow diagram in Figure 3, a brief description of the system can be provided here. The pilot project deployed at Amal West is a 17,280 sq.m 7MW solar thermal plant that utilizes parabolic trough mirrors (part #4) suspended within an agricultural glasshouse (part #2). These mirrors track the sun using a simple cable drive system and intensely focus sunlight onto specially coated receiver tubes (part #3) carrying water, which is heated to produce 80% quality steam at 100 bar. The tracking angle of the reflector mirrors are measured by inclinometers with 0.01 deg accuracy. The weight of the mirror and frame is stated to be 4.2 kg per sq.m. The receiver tubes are of non-articulated design and are suspended from the glass enclosure by steel rods (part #5) in tension. The reflectors are suspended from the receiver tubes using similar rods, also in tension. The receiver is based on a standard, 2-in. carbon steel boiler tube. The receiver tube is polished and coated, with a selective absorber coating that is designed to maximize the absorption of solar radiation, while minimizing the losses via the emission of infra-red radiation. Tubular glass shields are stated to minimize heat losses from convection . A once through steam generator (OTSG) incorporates features of a standard oilfield boiler and accommodates feed water with total dissolved solids (TDS) as high as 30,000 ppm. Boiler feedwater is usually either “produced water” separated from production oil or is pumped from brackish or saline aquifers. A distinct advantage of the boiler is that it isn't recirculating, therefore it doesn't demand the use of demineralized water. The control system tightly calibrates the steam quality to avoid precipitating scale deposits within the evaporator tubes. According to the literature, some scaling might still occur in the boiler, due to excursions in water quality or chemistry. The system design incorporates features to enable receiver cleaning by pigging in the same manner as a standard oilfield boiler. Closed loop pointing control delivers < 0.5 mrad pointing error at hundreds of points within the glasshouse. Pointing accuracy is maintained without regard to wind velocity, as collectors reportedly operate in a zero-wind environment always. The system has an automated roof washer (part #1) with a claimed capacity to clean the entire roof surface each night while the collectors are offline. The majority of wash water is returned in the gutter system and can be recovered for re-use. An air-handling unit (part #6), supplies filtered, dried air at slight overpressure within the structure in all conditions to reduce dust infiltration. This is designed to cope with intense dust storms of long duration. A pump skid pressures the feed water into the solar field. Literature states that an 80 cu.m upright insulated water tank was added to the system during the year to improve overall performance. The tank removed direct dependence on water supply, and allowed the recovery of waste heat into the feed water during transient periods. This replaced the initial idea of a heat exchanger which reportedly caused transients in the receiver pipes and led to unstable operation. Detailed operating philosophies are not available in the public domain for this plant, however the following points are understood from reading the sources of literature in Table 2. The plant process flow diagram (PFD) in Figure 4 is referred in this discussion. 1. Two on-site calibrated shadow band radiometers measure and calculate solar DNI. Based on average DNI recorded for each minute of plant operation, a model predicts and calculates the plant performance, including start of steam export and steam output in tonnes. 2. After the previous night’s wash cycle, water is circulated at a minimum flowrate every morning. The system is to brought to an operating temperature of 310 deg C and level established in the steam separator drum before start of export can take place. It takes anywhere from 40-70 minutes to bring the system upto operating temperature. 3. A feedforward control loop modulates water flow to the plant based on incident DNI and modeled efficiency based on current position of the sun. 4. The separator is used to accurately meter the saturated steam as well as condensate production. Temperature, pressure and level readings are taken from the separator. 5. Steam flow is measured across an orifice with a differential flow meter. 6. Output steam quality is kept strictly at 75% +/- 5%. This is done by metering water and steam and mixing them both downstream of the differential flow meter 056. If quality were to fall below the target, a control valve on the condensate line tagged V030 is opened to maintain level in the steam separator vessel. The excess water is stored in the 80 m3 water tank to avoid wastage. If the quality is more than the target, the control valve V112 is opened to allow more water to mix and bring down quality. Both V112 and V030 are normally closed valves according to the PFD. 7. The export steam is then introduced into the oilfield steam distribution header, where steam from the gas boiler and solar plant come together before being introduced into the injection well. 8. It is understood that the solar EOR is designed to deliver an average steam output of 50 tonnes/day but this when taken as a percentage of the total steam capacity of the field is a small number. Therefore, it does not lead to significant pressure or rate variations in the steam distribution network. 9. Cleaning of the roof is done every night by automatic roof washing system. Literature states that at least half the roof has to be cleaned every day for optimal performance. 10. The primary control interface at the site is a Supervisory Control and Data Acquisition (SCADA) PC on which all operating data is recorded in one minute intervals. After reviewing the literature in Table 2 and some additional literature on this subject, the following are the results from the author's assessment. The study period in Glasspoint’s SolarPACES paper appears to be around 3-4 months in 2013. During this time, the plant is stated to have been commissioned on time and within budget constraints. The performance of the plant was within 1-2% of the modeled performance and from the 100 days of monitoring, the plant exported a cumulative of 5000 tonnes of steam. However, longer periods of time are required before a clearer assessment of plant efficiency, plant reliability and lifecycle operating costs can be made. Components fail, are replaced and lessons are learned during longer time periods. Some specific reliability issues are highlighted by Glasspoint in a supplementary report (Table 2 item#4). This shows that longer time periods in operation can catch more flaws. 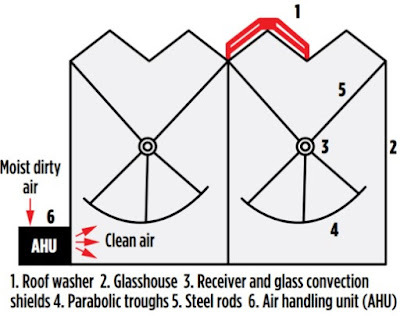 1 a) Glass breakage: The supplementary Glasspoint report, item #4 in Table 2, states that 8 glass panes were broken during the operation of the plant. It is not clear what kind of supplementary damage this did to the componentry inside the glasshouse. It was mentioned that the panes were tempered glass that typically shatters to small pebbles. Any breakage is picked up by the pressure and flowrate fluctuations through the air handling unit and operations personnel are alerted for a replacement exercise during the nighttime. 1 b) Waste heat capture: It was pointed out in the same report that the initial plan of installing a hot water tank in the plant was later replaced by that of a heat exchanger to reduce system costs. Later, it was found that the heat exchanger introduced transients in the solar receivers which became ‘unstable’. Due to this, the original idea of a hot water tank was implemented along with its cost adder. It was stated that in all future designs, the hot water tank will be an essential component because it reduces downtime and water consumption. A more detailed discussion of the problems created by the heat exchanger is however missing in the literature. 1 c) Electronics reliability: One of these reliability risk points that perhaps will be made clear from long term performance monitoring center around the instrumentation used inside the hot glasshouse environment. It is not clear how many failures or malfunctions have been factored into the operations by Glasspoint. All the given literature states that all such electronics underwent accelerated life testing before installation, which is a way to validate designs. Verification of those validated designs, i.e performing the stated function under real working temperatures and operating conditions, haven’t been mentioned in the literature. 1 d) Steam leakage due to cyclic operation: An interesting point in the Glasspoint report are observations of steam leakages in NPT connections. They found that steam leaks were more of a problem than in a traditional fuel-fired steam system, which they attribute to the daily cycles of operation from hot to cold. Leakages were found to take place even when the fittings fully complied with standard codes for design. As a solution, welded connections were used. The report also states that in future, where welds cannot replace flanged connections, engineered compression washers will be used. Wedge gate valves also caused leakage problems, and sliding gate valves or metal-seated ball valves were recommended for future installations. 1 e) Roof sealing system issues: Plastic weather strips were used in the roofing initially. These failed due to thermal gradients and intense temperatures. They were subsequently replaced with an all-aluminum sealing system. It is not clear in literature what the cost adder of this modification must have been. The peak efficiency of the Amal West plant is stated to be 66%. When compared with EUROTrough, a European parabolic trough project for power production, this efficiency is reportedly around 5% lower. The SolarPACES plant performance paper attributes this reduction to roof structure shadowing, glazing losses, the use of an air-stable selective absorber coating and non-evacuated receiver. But the paper fails to expand on these issues even though they are stated to cause efficiency losses. The author’s own assessment here is that CSP plants built for electricity generation will tend to emphasize the optimization of losses more than a plant geared for steam flooding, such as Amal West. Perhaps there wasn’t so much of a design emphasis to reduce losses for the enclosed STEOR project to begin with due to what the literature claims were “small losses”. It is emphasized here that even though the efficiencies relative to EUROTrough were lower, the annual steam output for the 2011 Amal West plant was reportedly 2.25 MMBTU per sq.m, compared to EUROTrough’s 1.25 MMBTU per sq.m. Although dust storms happen occasionally in the Middle East, the Amal West Plant did go through an 40kph dust storm during April 2013. It is stated that the plant continued to operate during this time and produced 48 tonnes of steam. The report, item #4 in Table 2, stated that after the storm subsided, a 12% degradation in performance was seen. What is not obvious is the percentage contribution of gas and steam during this extreme event. A clearer picture of the performance characteristic of the plant during the storm would be desirable to evaluate the real contribution of the glasshouse. The washing system appears to be only for the roof. A dust storm or even a week spent in a normally dusty environment can potentially soil the sides of the greenhouse as well. It is not obvious if the sides also have a washing facility in addition to the roof system. It is also not obvious how the soiled sides can potentially contribute to plant performance degradation. Could there be a shading factor contributed from soiled sides? The three pillars of sustainability is viewing any technology, such as those used in energy conversion, from a lifecycle economics, energy/emissions and social cost point of view. Although such inventorying is not an easy task, this is a robust way of proving that the when viewed from a cradle to grave perspective, there are benefits in life cycle impacts compared to conventional solutions. Such lifecycle studies are sensitive to where the projects are sited since each phase of that project will be specific to that site and that customer. The enclosed STEOR plant at Amal West is a hybrid design. Nighttime steam production is 100% from gas fired boiler system. It is a reasonable assumption that gas maybe used entirely for 16 hours in a 24 hour day which equates to 5840 hours of gas usage in a year. Stated in other words, at the minimum gas is used to generate steam 67% of the year (in reality this figure is different because the solar plant works in series with the gas boiler during the day and the hot water storage tank is also a contributor). Nevertheless, the emissions of 5840 hours of gas usage still have to be accounted for. Brandt and Unnasch have analyzed greenhouse gas emissions from TEOR using natural gas and some alternate fossil fuel sources. Their numbers are useful for comparison. They found that with current recovery techniques, 121 g CO2 / MJ RBOB is the gross average life-cycle emissions for TEOR production in California . This figure includes production, refining, transportation, and combustion of the resulting gasoline. Of these gross CO2 emissions, 24.4%, or 29.5 g CO2 / MJ RBOB, are associated with the combustion of natural gas for steam generation before any emission credits for cogeneration. Cogeneration systems generally consume more gas per unit of steam produced in comparison to direct-fired steam generation, but they produce electricity as well that must be credited in some fashion. In a similar sense, solar steam generation might be credited. Literature states that a modest solar fraction of one-third of the total steam generated results in a reduction in emissions of 10.0 g CO2 / MJ. According to the study conducted by Stanford students in , an enclosed high solar fraction plant in California showed considerably less lifecycle emissions when compared to a 100% fuel powered TEOR system. The enclosed STEOR lifecycle study must be specific to the Oman project. For example, it has been stated that manufacturing of glasshouse and well as multiple tests were done at the Glasspoint factory in Shenzhen, China. This may have helped decrease production costs however the emissions have to be inventoried at the China factory and during the transportation phase of those components to site. The glasshouse also necessitates additional civil works to lay the foundation work for the structure, which involves a heavy machinery emissions burden and possibly land based ecosystem concerns due to the foundation (possibly irrelevant for a desert environment). Overall, when viewed for the entire lifetime, it does appear that these emissions contributions may be low compared to operational energy and emissions savings. The enclosed solar EOR appears to be a product for niche implementations. For a start, steam EOR is strictly based on pattern size and the geologic background of the site, and particularly suited for heavy oil. It may not be suitable for all sites. 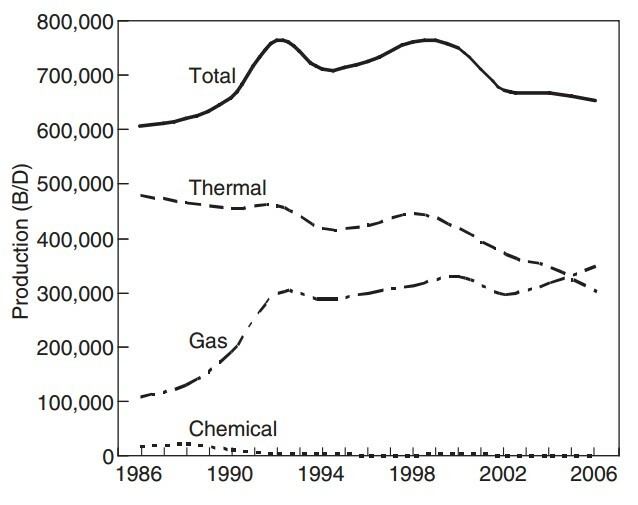 Literature  shows that thermal EOR is on the decline. 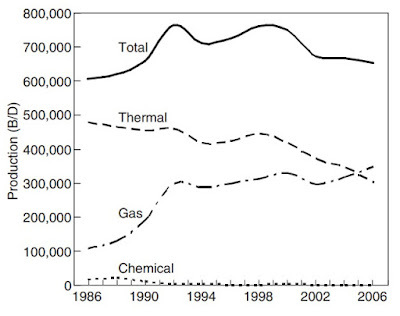 The total EOR production in USA is declining (Figure 5). The major contributor was thermal methods, and that is also on the decline, mainly because most attractive reservoirs have already been exploited . That said, STEOR may make sense for Middle East sites with heavy viscous crudes and sandy desert environments. It may also make sense for clients who want to reduce their gas usage, and who could sell that saved gas instead at a premium. However, it is not clear what the future rend in market potential is for the Middle East, particularly with low oil and gas prices nowadays. From the economic study in item#3 in Table 2, it appears that STEOR projects are very sensitive to oil and gas prices. 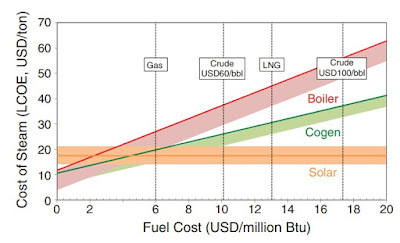 Figure 5, taken from the Glasspoint study, compares the fully burdened levelized cost of energy (LCOE) for three methods of steam generation - boiler, cogen and solar - and their relationship to the fuel price. Since the true cost of any of the methods are subject to externalities, they are shown banded. 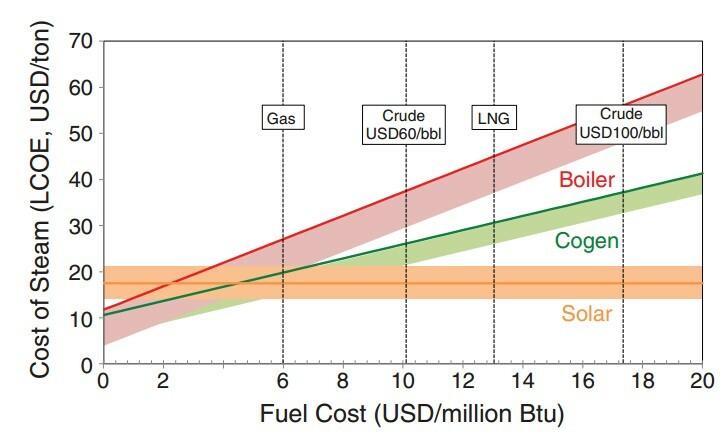 But what is clear from the graph is that which method of steam generation to select depends entirely on the fuel cost question. In the Middle East, where fuel prices are subsidized, this analysis becomes slightly more complicated. When viewed from the perspective of the marginal fuel cost, it appears that the cost cost off point where solar steam can be cheaper than cogen and boiler based steam is around US$ 6/million BTU. Note that the cost of solar stays constant at US$ 17/ton of steam because it doesn’t depend on fuel for steam generation. Figure 6: Levelized cost of energy (LCOE) vs fuel cost for solar, boiler and cogeneration based steam generation. Source . The enclosed solar EOR project is also land asset sensitive and it is not obvious whether land asset costs have been considered in these LCOE comparisons. According to Glasspoint literature, compared to a solar tower based heating plant, the glasshouse plant requires 15% more land coverage. Moreover, there is a requirement that the plant has to be situated close to the point of injection wells since steam deteriorates with distance. In the author's experience, oil field plants tend to be tight with respect to system integration and footprint and QHSE concerns set up minimum separation distances for the balance of plant. All this sets up unique, sometimes conflicting requirements that are dependent on the project and the stakeholders. It has been stated in the SolarPACES construction paper (Table 2 Item# 1) that initially there were manpower productivity issues because of labor inexperience with laying the solar trough and glasshouse. This is a project risk point to be highlighted for not just solar STEOR, but for the introduction of any emerging renewable energy technology in the Middle East. Therefore, to a client, in addition to the cost of setting up the enclosed STEOR, training unskilled workers and risking time slippages due to decreased productivity are to be factored in. This point seems applicable for the screening issues discussed in point 6 above. An enclosed trough STEOR plant, built by Glasspoint Solar at Amal West (PDO) in 2012 is the subject of this article. In Table 2, it was highlighted that a limited number of papers and reports were reviewed to make the assessments. Enclosed STEOR appears to be a niche product for site specific geology and oil viscosity. It is not a technology that is applicable everywhere. From the SolarPACES paper however, it does appear that the Amal West plant performed exceptionally and within 1-2% of the expected efficiency. Several of the challenges that the company faced during the installation and commissioning phase, particularly relating to failures of plant equipment and productivity issues centering around labor in Oman, were honestly highlighted in the papers and reports. These have been taken into consideration as lessons learned topics for future implementations. That said, the performance reports in Table 2 are still short term. Long term studies can reveal the true reliability picture of enclosed STEOR installations. Some of these concerns were highlighted in the assessment section of this paper. The author had approached Glasspoint in order to get a better understanding of these concerns, however a response is still pending from Glasspoint's Business Development Manager. Enclosed STEOR is particularly sensitive to the oil and gas prices. Unless fuel price subsidies are removed in the Middle East, this solution, and in general solar based steam generation, will face continued pressure from conventional fossil fuel based methods of steam generation. This ironically may dampen the additional spread of enclosed STEOR to other parts of the Middle East, potentially preventing enclosed STEOR cost reductions due to additional scale and added field experiences. In conclusion, as a pilot project commissioned for the first time in Middle East, and for helping a country like Oman save precious gas reserves, it appears that the ADIPEC 2015 award to Glasspoint and PDO for Best Oil & Gas Innovation is well deserved. It appears that there are more positives than negatives for this technology. In addition, the fact that additional enclosed STEOR projects are being discussed, particularly a larger implementation in Oman (MIRAAH 2015) and another for Kuwait, proves that investor interest in this technology is growing. < http://www.slb.com/services/technical_challenges/enhanced_oil_recovery.aspx > Accessed on Nov 2015. Petrowiki, Thermal recovery by Steam Injection. Available at < http://petrowiki.org/Thermal_recovery_by_steam_injection > Accessed on Nov 2015. Sandler et. al. Solar-Generated Steam for Oil Recovery: Reservoir Simulation, Economic Analysis, and Life Cycle Assessment. SPE Paper# 153806. 2012.